We think that this fun and fruity cake is great for weekend baking! 1. Preheat the oven to 180°C (160°C for fan ovens), Gas Mark 4. 3. Pour the condensed milk into a bowl and add the lemon zest and juice (it should thicken). Beat in the soft cheese. 4. Place half the raspberries into a small bowl and mash with a fork until very juicy (you can add a drop of water to help this along). 5. 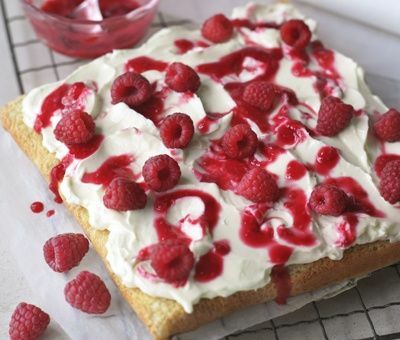 Spread the creamy frosting on top of the cake and then drizzle with the raspberry sauce. Top with the rest of the raspberries and serve. Will it roll up like a swiss roll? Hi Irene, what a great idea! We've not tried it but my advice would be spreading the mixture a bit thinner in a larger tray. Once cooked place on a damp, clean tea towel and roll up. Allow to cool and then unroll and spread the topping on as a filling. Reroll and sprinkle with raspberry sauce. Be careful, it will cook quicker if thinner. Let us know how it turns out! No butter in this sponge???? Hi Barbara, yes that's right - this one is a fat-less sponge a bit like a swiss roll! This is one of our light cake recipes - meaning that it is atleast 30% less fat or calories than a standard cake recipe, so you can have your cake and eat it too!